SPRINGFIELD — Everyone has heard the narrative: struggling urban schools, a budget shortage, and further cuts to music education, because the arts are regarded as fat we can afford to trim. But there’s a problem with assuming that music education is easily disposable: It’s not. Just look at what’s happening in Springfield. One recent Thursday afternoon, 300 band members from this city’s High School of Science and Technology were warming up for the school’s commencement at Springfield Symphony Hall. At SciTech it’s hardly a given that younger students will in fact graduate. In 2014 the school’s dropout rate was five times that of the state. Its students come from among the poorest communities. But things at SciTech are looking up, and the band is playing a lead role in the turnaround. Students who play in the band for more than one year are three times as likely to remain in school. And its graduates are going on to college in ever higher numbers. 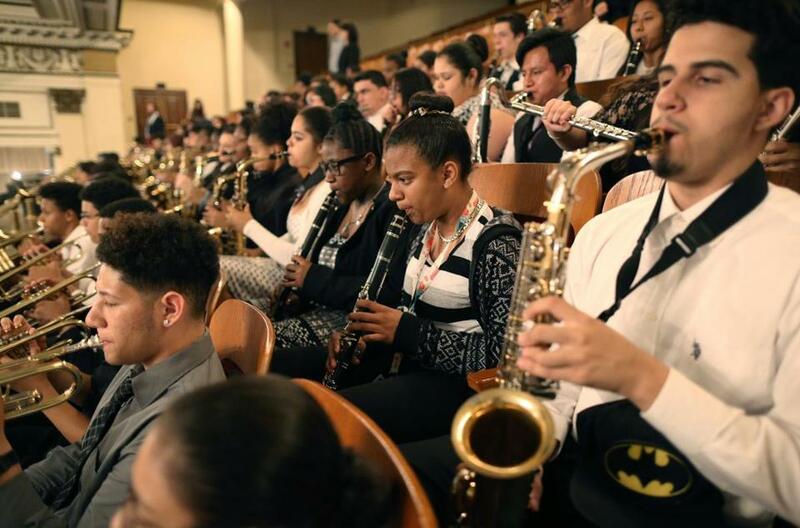 The band’s success comes at a time when musicians and educators in urban centers across the country have increasingly turned to intensive music education as a vehicle for empowering students and building community. What makes the SciTech band unique is the sheer size of the endeavor, which has attracted almost 40 percent of the school’s student body, and the vitality of its playing, which has a way of popping off the stage. Back in the hall, Bernice finished his pep talk, climbed up to the top of a stepladder in the center of the stage, blew four crisp beats from a whistle hanging around his neck, and then cued a tidal wave of sound. Freshman Yumarelis Webb (center) played the clarinet during a rehearsal. The end of school on Tuesday marks a band milestone, too: 10 years under Bernice’s direction. When he arrived — in the middle of the 2006-07 school year, because his predecessor had quit — the band had 20 students. Bernice discovered that those students had spent much of the year watching ESPN, and had never had a chance to perform a single concert. He had a different plan in mind. At his first band meeting, he wrote on the board a single word: ownership. As Bernice and associate band director Shelby Carne sketched out the band’s activities, their vision of community came into sharper focus. The band runs after-school music and academic tutoring programs five days a week, keeping students in the building (and safely occupied) until around 6 each night. Now some 500 SciTech students play in the band — dwarfing participation at similar schools. All of them arrived unable to read a note of music. Last year the band was the subject of an inspiring documentary. Bernice has created a system of volunteer student leadership within the band, and its mentoring practices are being replicated within the school as a whole. SciTech as a whole still faces a steep climb, and has had eight different principals in the last decade. But the band has become a symbolic point of pride in a city struggling to overcome what students feel is an unjustly negative reputation. Looking ahead, Bernice said the goal is to extend and deepen what is already in place. 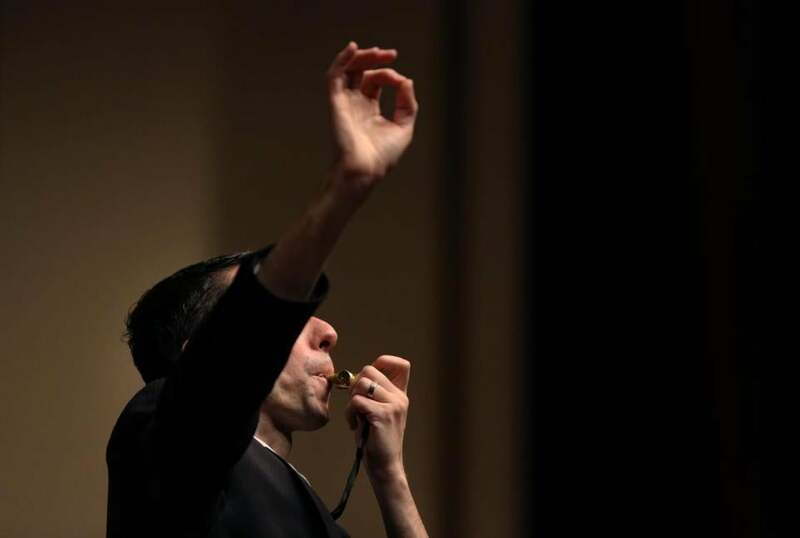 Band director Gary Bernice blew his whistle during a rehearsal.